Brands including Wego, Twitter, Alibaba, Lancôme, and Debenhams have turned to Progressive Web Apps (PWA) to provide fast, frictionless mobile experiences for customers. Daniel An, Google’s Global Product Lead for mobile web, spoke with Mobify CEO Igor Faletski to find out what PWAs can do for a company’s revenue. If you’re reading this, chances are you’ve been tasked with keeping abreast of technological changes shaping the industry. You may have led your company through at least one digital transformation project. Or maybe you’re considering one in the near future. You know the kind—the ones that involve massive migrations, but the benefits aren’t seen until years after the project is completed. A Progressive Web App just might offer another way. I spoke with Mobify CEO Igor Faletski, whose company partners with brands to create PWAs, to learn about how some of the most forward-looking companies approach their investment in mobile site development and the benefits of PWAs for the bottom line. Daniel An, Google: What are progressive web apps, and why should people care? Igor Faletski, Mobify: Progressive Web Apps enable fast, app-like experiences with the reach of the web. The user experience is immersive and loads instantly, even in poor network conditions. Think of it like a mobile app, but on the web without having to go to the App or Play Store. Are there certain type of companies/sectors who benefit from a PWA? What's the thing that propels these companies to get a PWA? Faletski: Any company that sells online would benefit from a PWA. As mobile page load time goes from 1 second to 5 seconds, the probability of bounce increases 90%.1 So if customers get held up by a slow checkout, the sale is at risk. The enhanced user experience and fast page speeds of a Progressive Web App allow the customer to complete their desired task quickly and efficiently. If a customer gets held up by a slow checkout, the sale is at risk. Customer expectations are evolving and companies need to offer more immersive, faster experiences on mobile in order to continue driving, and increasing, revenue. With the high cost of acquiring users, what makes a PWA an efficient and effective solution? What kind of results have you been seeing? Faletski: Our own research has found that PWAs deliver two to four times faster page speeds, ensuring your hard-earned users stay engaged and convert. A common myth when choosing to invest in web and/or native apps is that you’ll inevitably be faced with making tradeoffs. What is your take on that? Faletski: Historically, apps provided a richer experience than the mobile web, but that’s changed. Businesses can now provide the same high-converting, app-like experience of a native app to its much larger audience on the mobile web so there really is no tradeoff anymore. That being said, you probably don’t want to close your app down if you already have one. Fortunately, there are solutions that will allow you to extend your PWA with fully native components so you don’t need to manage separate web, iOS & Android codebases. What advice would you give to someone who is thinking about building a PWA now vs. later? Faletski: Mobile is the only channel consistently growing year-over-year in the retail industry. This past Black Friday weekend, our own data showed year-over-year mobile traffic increased upwards of 20% some days, while desktop traffic decreased or remained relatively stagnant throughout the entire period. Shoppers are moving to mobile, and retailers that aren’t able to convert that traffic into revenue will lose out on significant sums of money. Our customers typically see a 20% revenue boost with a PWA, so every minute you don’t have a PWA is a minute spent with 20% less revenue on your busiest customer touchpoint. 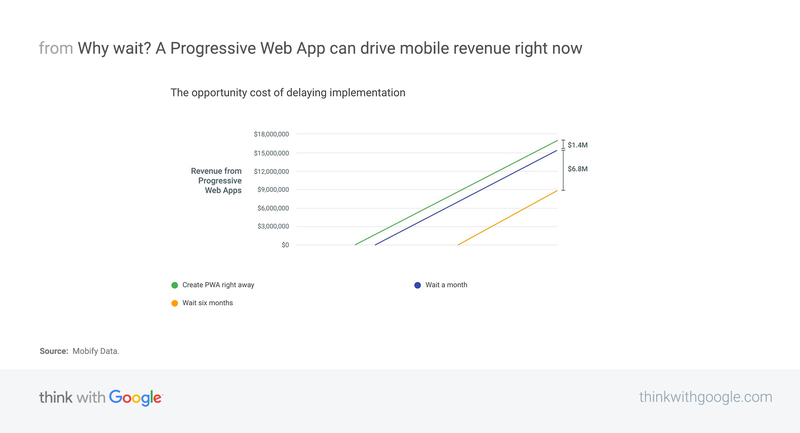 As an example, a retailer with $20 million in annual ecommerce revenue could lose $1.4 million by waiting a month to offer a PWA, and another $6.8 million by waiting six months. What are some common challenges companies should keep in mind when building a PWA? Faletski: Lack of experience is a big problem. Retailers who have never built a PWA will inevitably run into unanticipated challenges such as how to correctly cache content without causing problems for your order management system, which can misalign customer expectations on stock availability. It’s also important to remember that PWAs are applications not web pages, even though they are built using web technologies. Analytics might be another issue. Most third-party integrations, including analytics, were not built from the perspective of running in the PWA context. Most events that these third-party trackers look for don’t happen in a PWA. Look for a platform with out-of-the-box integrations for analytics to bypass these challenges. Build your PWA on a platform so that you can deploy and evolve. If you build it in-house from scratch, when you’re done, you’ll have whatever you started building today. In that time, a platform will have evolved to include a host of new features and functionalities for all its customers.